2,000ish sq. 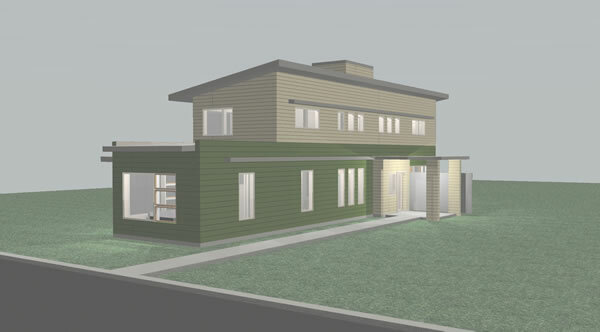 ft., 2 bedroom, 2 story green, modern house. Click here to view the first floor and second floor pdfs. 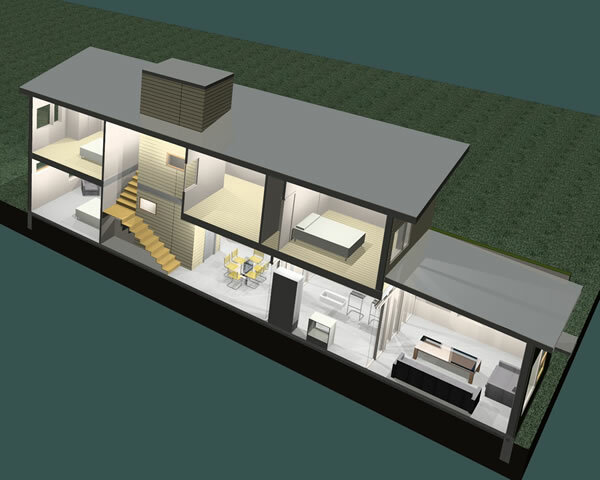 Click here to see dimensions and layout of the R1 Residential with The R1 addition. 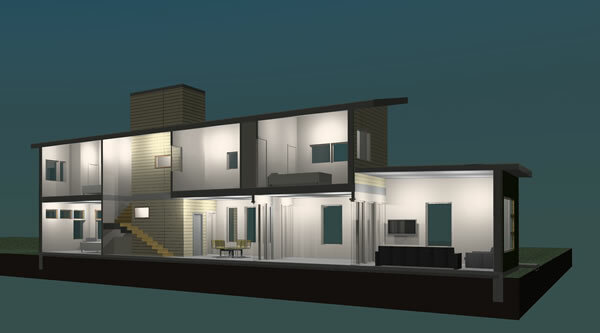 Click here to see dimensions and layout of The R1 Residential with The R1 garage. 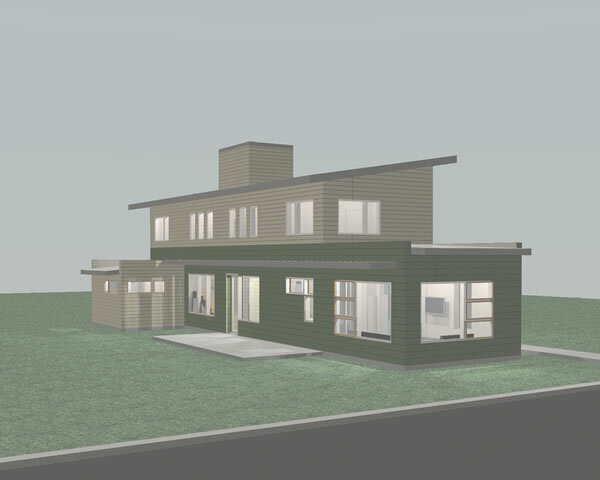 We want a green, modern, gorgeous, affordable house. I approached 3 North to work on The R1 Residential as they specialize in small spaces. How can you make a larger house than casa ti while remaining responsible? With 3 North... easily. Let's talk about this two story design. Look at that central stack: it is designed to serve as the lungs and the digestive tract of the home, enclosing the whole house fan and any other HVAC systems, and serving as the conduit for fresh air to be drawn in from the perimeter windows to be exhausted through louvers at its peak. Additionally it houses the powder room, the hall bath, and the laundry room, affording an efficient and economical plumbing layout. Check out the partitions in the dining area. And the translucent panels that let in light and a sense of space yet maintain privacy in the bathroom, in the partitions... and guess what, folks? The R1 Residential also has NEW ADD ONs... Yes, a garage and suite, because those of you with five and more children were able to convince me you needed it. The Wall and Roof Packages are SIPs (Structural Insulated Panels) which provides great insulation. In fact, the R value for the 8 3/8” roof panels has an R-value of 29.3 when tested at 75 degrees F and a 31.6 when tested at 40 degrees F. The 6 5/8” wall panels have an R-value of 22.6 when tested at 75 degrees F and a 24.3 when tested at 40 degrees F.
Sliding translucent screens providing flexibility in space delineation. Click below to see the floorplans, enlarged. And guess what? We have add ons.